So what's happening at the end of May in the Austrian province of Carinthia that Audi would care about? How about the 27th annual Lake Wörther Tour? Sure. What's that? Yeah, we've no idea. What we do know is that the four-ringed brand's revealing what they've buzz-worded "a sensational study" and what they've named the Audi A3 TDI clubsport quattro. The concept features a two-liter TDI engine delivering 224 HP and 331.9 lb-ft of torque. That's sports car quality power from a form factor that — well, has a bit of booty in the back if you catch our drift. And the purported performance numbers are definitely performance quality — a 0-to-62 of 6.6 seconds and a top speed of 149 mph. Nice. We like. Full speed ahead past the jump for the press release. Audi, the inventor of TDI, blazes a trail in the field of engine manufacture. At the 27th annual Lake Wörther Tour being held at the end of May in the Austrian province of Carinthia, the brand behind the four rings is showcasing this technology's potential with a sensational study. The two-liter TDI unit under the bonnet of the Audi A3 TDI clubsport quattro delivers 165 kW (224 hp) and musters up 450 Nm (331.90 lb-ft) of torque - the sort of pulling power normally associated with a sports car. The show car races from 0 to 100 km/h (62.14 mph) in just 6.6 seconds and attains a top speed of 240 km/h (149.13 mph). The Audi A3 TDI clubsport quattro projects its power with supreme confidence - both acoustically courtesy of its sonorous exhaust and visually with a series of exclusive parts mounted on the body and in the interior. Exterior components such as the large DTM-look rear spoiler and the bolt-on wheel arch extensions give the car a dynamic air, while the racing bucket seats and open gear lever gate in aluminum form the highlights of the interior. The show car is a true high-tech sports car. The drive power is directed to the 20-inch wheels via a six-speed transmission and the quattro all-wheel-drive system. At the front wheels, stopping power is provided by six-piston brake calipers and ceramic discs. The Audi drive select driving dynamics system allows the driver to vary at will the throttle response characteristic, the exhaust sound, the level of power assistance for the steering, the cut-in thresholds for the ESP stabilization system, as well as the operating mode of the dampers. The dampers deploy Audi magnetic ride technology, enabling them to react to changes in the driving situation with lightning speed. Audi is the trailblazer of engine manufacture. Since their debut back in 1989, the TDI engines have long since established themselves helped by their powerful, refined and efficient character. The triumphant advance that the diesel-powered Audi R10 TDI racing car has been enjoying for two years now in the Le Mans 24 Hours and in the American Le Mans Series is clear testimony to this technology's tremendous potential. The engine in the R8 TDI Le Mans study is closely related to the diesel race engine technically speaking - the high-performance sports car is equipped with a six-liter V12 power unit whose output of 368 kW (500 hp) and torque of 1,000 Nm (737.56 lb-ft) are good for a top speed comfortably in excess of 300 km/h (186.41 mph). The R8 TDI can also be seen at the Lake Wörther Tour, as the major annual gathering of horsepower-happy Audi and VW enthusiasts is known. Audi has already transferred the superior power of the TDI engines into its road-going cars: the TT and TT Roadster both feature a mighty two-liter unit generating 125 kW (170 hp) and 350 Nm (258.15 lb-ft) of peak torque, coupled to the quattro all-wheel-drive system. As is plain to see, Audi continues to build on its lead in the technology stakes. A TDI from Audi is more than just another diesel - it is, in fact, a dynamic power unit and a rich source of driving pleasure. At the 27th annual Lake Wörther Tour being held in the Austria province of Carinthia from May 21-25, Audi is demonstrating the potential of TDI technology with a very special concept study: the Audi A3 TDI clubsport quattro is powered by an engine delivering a whole 165 kW (224 hp) from its displacement of two liters. And with a torque of 450 Nm (331.90 lb-ft), it endows the premium compact model with the pulling power of a sports car. 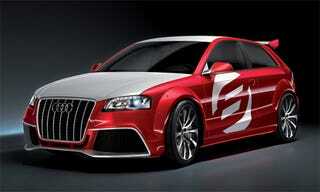 The Audi A3 TDI clubsport quattro qualifies as an uncompromising sports machine in all other technical respects too. A six-speed transmission channels the engine's power to the quattro all-wheel drive. 20-inch wheels keep the drive force glued to the road; behind the wheels at the front can be found brake disks made from carbon-fiber-reinforced ceramic. Using the Audi drive select driving dynamics system the driver is able to adjust the throttle response and exhaust sound characteristics, the steering's power assistance, the ESP control and the damper characteristics as desired. The dynamic image presented by the scintillating A3 study is rounded off by spectacular body styling and a high-class, sporty interior. Parts such as bolt-on wheel arch extensions and a large rear spoiler lend lasting impact to the exterior's looks; the interior is dominated by the racing bucket seats in the front and the open aluminum gear lever gate. The Audi A3 TDI clubsport quattro has a distinctly confident air about it. Sensational styling instantly sets the three-door show car apart from the standard production Audi A3. It measures 4,254 millimeters (167.48 inches) millimeters/2.36 inches), but just 1,385 millimeters (54.53 inches) high, - a reduction in height of 36 millimeters (1.42 inches) in spite of the large wheels. The track width measures 1,568 millimeters (61.73 inches) at the front (+ 34 millimeters/1.34 inches) and 1,553 millimeters (61.14 inches) at the rear (+ 46 millimeters/1.81 inches). The design team has kitted out the Audi A3 TDI clubsport quattro with a whole array of new exterior parts to give it an extremely sharp and dynamic look - almost like a racing car. The paint finish is also a picture of vibrancy: the engine hood, tailgate and roof are Ibis White and the flanks Brilliant Red, while a large white figure "8" is emblazoned across each door in reference to the year 2008. The color scheme is an allusion to the colors of the Austrian national flag. The single-frame grille has grown slightly in width, which also entailed modifications to the engine hood. The grille's bars - including pronounced vertical sections - have a high-gloss black finish. The bi-xenon headlamp assemblies are embellished by LED daytime running lights and wings. The front bumper incorporates large, square-edged air intakes, together with a blade section that juts a long way forwards and is slightly raised in the centre. The modified front fenders feature bolt-on wheel arch extensions. The doors and the rear side sections - again with muscular wheel arch paneling - have been given a new, boldly contoured flare at the bottom. This blends together harmoniously with the door sills, which have themselves been restyled. The exterior mirror housings, with their arms that look to have been crafted by the wind, are likewise new. The tinted glass used for the rear windows gives the model yet greater visual presence. The tail of the Audi A3 TDI clubsport quattro sports a dark grey diffuser. It is a variant on the design of the front blade, and incorporates the two large circular tailpipes of the separate exhaust branches. Modifications have also been carried out to the tail light assemblies. The most striking impression, however, is made by the spoiler atop the rear window that bears a close resemblance to the part featured on the new A4 race car from the German Touring Car Masters (DTM). Inside the Audi A3 TDI clubsport quattro, the eye is immediately caught by the illuminated door sill trims with their "TDI Power" badging. Awaiting the driver and front passenger are anatomically shaped bucket seats, just like those found in motor racing cars. The rear seats sport the same upholstery design, with special foam padding used to sculpture them into roomy and comfortable individual seats. The driver takes hold of an elegantly styled steering wheel with a flat-bottomed rim that is reminiscent of the Audi R8 high-performance sports car. The scales of the dials are colored white, the monitor for navigation and entertainment together with its control panel stems from the R8. The jet-style air outlets have multi-way adjustable louvers, and the usual buttons in the center console have given way to classic, sporty toggle switches. The bars underneath the console are covered in leather, the door handles have been milled hollow to save weight. The door linings and floor mats have been newly designed. The high-performance TDI under the bonnet of the Audi A3 TDI clubsport quattro is like nothing that has gone before it. From its displacement of just 1,968 cc, it summons up an output of 165 kW (224 hp). Torque - the true measure of effortless motoring ability - peaks at an exhilarating 450 Nm (331.90 lb-ft), which is on tap from just 1,750 rpm; in other words, the very bottom of the rev range. As for in-gear flexibility, the diesel model leaves its gasoline-powered rivals standing. The mighty TDI bestows the Audi A3 TDI clubsport quattro - which tips the scales at just 1,475 kilograms (3251.82 lb) - with pulling power befitting of a sports car. The sprint from 0 to 100 km/h (62.14 mph) is over in a fleeting 6.6 seconds and the speedometer needle keeps rising all the way to 240 km/h (149.13 mph). The four-valve sports engine is smart too; it responds spontaneously to the throttle and pampers the occupants with the low-vibration running of its mechanics. On an acoustic level, however, it proudly proclaims its abilities for all to hear: the exhaust system is a new development, with controllable resonance chambers on both tailpipes to amplify the rich, sonorous sound. The engineers took as a basis the undersquare engine (bore x stroke = 81.0 x 95.5 millimeters) with an output of either 103 kW (140 hp) or 125 kW (170 hp), depending on the configuration, and added to it an optimized turbocharger. The advanced design of its blades allows it to supply more air; as in the series-production version, the variable geometry of the turbine's blades ensures spontaneous response. The 2.0 TDI, which is managed by one of the most sophisticated control units currently available on the market, is brimming with high tech. Fuel injection is handled by a common-rail system with piezoelectric injectors and eight-hole nozzles. The high-precision metering of as many as five injections of fuel per power stroke has the effect of audibly reducing the noise level. The system operates at a pressure of 1,800 bar - this results in extremely fine atomization of the fuel which, together with the revised piston geometry, makes the combustion process a highly efficient one. The engine's intake manifold houses swirl flaps that generate a tumbling action in the inflowing air; electric motors regulate the flaps' position so that this tumbling motion is always perfectly suited to the current load and engine speed. Two balancer shafts in the engine reduce the degree of vibration in the crank drive. The drive unit for the belt that propels the two camshafts has also been reworked with a view to improving the engine's acoustics. In its high-performance 165 kW (224 hp) version, the 2.0 TDI unit is still able to make use of a high proportion of recirculated and sharply cooled exhaust gas to achieve cooler combustion with lower oxygen levels - this brings about a substantial reduction in untreated nitrogen oxide emissions. The four-cylinder power unit already complies with the limits of the Euro 5 emissions standard, which is not due to come into force until September 2010 and whose foremost aim is to cut NOx emissions. The ultra-efficient two-liter engine attains a power-to-displacement ratio of 83.8 kW (113.8 hp) per liter, and torque-to-displacement ratio of 228.7 Nm (168.68 lb-ft) per liter - figures which comparable gasoline engines are simply unable to match. The Audi A3 TDI clubsport quattro has been designed strictly in accordance with the principle of maximum efficiency. Power is transferred by a compact, transverse-mounted six-speed transmission whose casing is made from lightweight magnesium. The short-throw gear lever can be moved swiftly and precisely through a classic open gate made of aluminum. The transmission ratios have been adjusted and the components reinforced to make allowance for the TDI engine's extremely high performance. The engine's power is transferred to the road with virtually zero losses thanks to the quattro all-wheel drive. The system's key component is a multi-plate clutch which is positioned at the rear, thereby further optimizing the weight distribution. Under normal driving conditions, the electronically controlled and hydraulically operated clutch directs the engine's drive power to the front wheels; whenever necessary, however, an infinitely adjustable proportion of the propulsive force can be diverted rearwards. When altering the power split, the plates inside the clutch are subjected to high oil pressure, pushing them together - a procedure which is completed in a matter of milliseconds thanks to a newly designed pressure reservoir for the pump. The quattro drive constitutes the perfect power transmission system for the mighty two-door model, significantly enhancing traction, handling characteristics, stability and straight-line running, whatever the weather. The Audi A3 TDI clubsport quattro comes equipped with a sports suspension that is more than capable of handling the formidable power. The front suspension - a classic McPherson layout - is pivoted on a light, high-strength aluminum subframe. A rack-and-pinion steering system with a direct ratio produces a sensation of close contact with the road. Power assistance is generated by an electromechanical drive unit for high efficiency, and its level decreases as the speed increases. The rear suspension comprises four links per wheel which fulfill all manner of tasks. The trailing links absorb the propulsive and braking forces. As an aid to ride comfort, their configuration is relatively soft. The connections to the three transverse links, on the other hand, are rigid in order to direct transverse forces into the body with absolute precision. In this instance, the coil springs and shock absorbers are also kept separate from one another. The set-up is decidedly firm, while the body has been lowered by 36 millimeters (1.42 inches) compared to the standard production version. The Audi A3 TDI clubsport quattro rides on impressive ten-spoke wheels measuring 9 J x 20, which are in turn shod with size 265/30 ZR 20 tires. Whereas the brakes at the rear wheels were borrowed from the series-production A3, their counterparts on the front would not be out of place on a supercar: six-piston calipers exert a vice-like grip on brake discs measuring 356 millimeters (14.02 inches) in diameter. The discs themselves are made of a material which has been of tremendous value to the aerospace industry, consisting of high-strength carbon fibers embedded in hard silicon carbide. They have a lightweight construction, can withstand extreme levels of strain, are corrosion-free and have a service life in the region of 300,000 km (approx. 186,400 miles). The Audi A3 TDI clubsport quattro boasts yet another highlight in the form of the Audi drive select driving dynamics system. This system has control over a number of technical components that mould the motoring experience. By simply pushing a button, the driver can determine at will whether these components should work in the comfort mode, the dynamic mode or even the "Individual" mode that allows partial manual programming of the way in which they interact. In the show car, Audi drive select influences the engine's throttle response, the sound from the exhaust system, the power assistance for the steering, the cut-in thresholds for the ESP stabilization system, as well as the damper characteristics. This is where the adaptive damping system Audi magnetic ride comes in: a magneto-rheological fluid circulating in the shock absorber pistons alters its viscosity - and, by consequence, the damping characteristics - in an instant when a voltage is applied. The interplay between all these cutting-edge technologies makes the Audi A3 TDI clubsport quattro a thrilling road machine that is tremendously fun to drive. It darts into bends with exceptional spontaneity, and corners with stolid stability and at high speed, guided with unfailing precision by the sensitive steering. Its handling limits are extremely high, with just a minimal amount of understeer kicking in as the limits are approached. A sense of effortless, assured controllability is a key virtue of the A3 study - just as it is on all Audi models. Power, refinement and efficiency - ever since they first made their debut in 1989, the TDI engines from Audi have been synonymous with a sophisticated and smart form of sportiness, blazing a trail for the rest of the motor industry to follow. The triumphant advance that the diesel-engined Audi R10 TDI racing car has been enjoying for two years now on race tracks around the world has delivered a powerful demonstration of its potential. The R10 TDI has been causing a sensation since spring 2006, with its twelve-cylinder diesel powerplant ushering in a new era in the world of motor racing. The 5.5-litre TDI develops in excess of 1,100 Nm (881.32 lb-ft) - a torque figure that positively eclipses its gasoline-powered competitors. Its output of 650 hp translates into a top speed of around 330 km/h (205.05 mph). One of the fortes of the R10 TDI is its low fuel consumption. And fewer fuel stops means a higher average speed - the car's high efficiency was one of the key factors in its two successive victories at the Le Mans 24 Hours. Frank Biela (Germany), Emanuele Pirro (Italy) and Marco Werner (Germany) won in 2006 and 2007 in emphatic style. It is a similar story in the American Le Mans Series, where the diesel race car bearing the four Audi rings has racked up a string of successes, easily securing the constructors' title in the large LMP 1 category in both years. For the first time ever, superior TDI power from the race track can now be experienced in a series-production sports car - both the Audi TT Coupé 2.0 TDI quattro and the Audi TT Roadster 2.0 TDI quattro feature a diesel engine. The two-liter four-cylinder unit delivers dynamic thrust, with a power output of 125 kW (170 hp) and 350 Nm (258.15 lb-ft) of torque. Despite this, the TDI engine in the Coupé burns just 5.3 liters of fuel per 100 km (44.38 mpg) on average - a benchmark value in the sports car segment. Also on show at the Lake Wörther Tour is the Audi R8 TDI Le Mans, whose drive train technology is closely related to that of the R 10 TDI. The high-performance sports car is driven by a six-liter V12, whose 368 kW (500 hp) of output and 1,000 Nm (737.56 lb-ft) of torque propel the world's most powerful series-production TDI model to a top speed far in excess of 300 km/h (186.41 mph). The equipment, specifications, and prices stated herein refer to the model line offered for sale in Germany. Subject to change without notice; errors and omissions excepted.